After a temporary shutter and an owner shuffle, the modern meditation hub will offer a full schedule of mindfulness classes in November. A few months ago, Northwest Portland's mindfulness startup Hush Meditation quietly closed its doors to regroup. After marketing serenity by the hour to the city's corporate execs, business owners, and tech gurus, the company struggled to find its stride. Founder Kristin Reiter found herself torn between nurturing the young business and dedicating energy to her job as a concept director at Nike. Luckily, Hush community member Chanel Carlascio stepped up to head the company, relocate, and refresh with a goal of inclusivity and affordable community offerings. "I joined Hush in June of 2015, after looking for a place to meditate in Portland for years," Carlascio explains. After her first month as an avid member, she went on a business trip and returned in July to find the doors had been closed for good. Rallying around Hush instructors and meditators who wanted to see the business reborn, Carlascio acquired the company and found a new home in the Gatsby Building (1306 NW Hoyt, near Barista in the Pearl District). Though the new building's hardwood floors and brick walls are a change from the first Hush's concrete, minimalist lines, Carlascio hopes it will preserve the intention of the original space, "offering an open, comfortable, and quiet spot to meditate, with a definite feeling of groundedness." As for the initial target audience of corporate execs, Carlascio hopes to preserve that demo as a core of the business, while offering affordable community classes and an inclusive vibe to welcome all who are interested in meditation's benefits. "Those of us who run businesses need a space to clear our minds, but I think that this is something that all of Portland needs," she explains. Hush regulars will recognize many of the same instructors, and can expect some new faces that will fill in the schedule as the new community grows. Regular classes will start in the new space on November 9. Follow Hush on Facebook to check out the new schedule and stay up to date with events and news. Want to check out the new space? 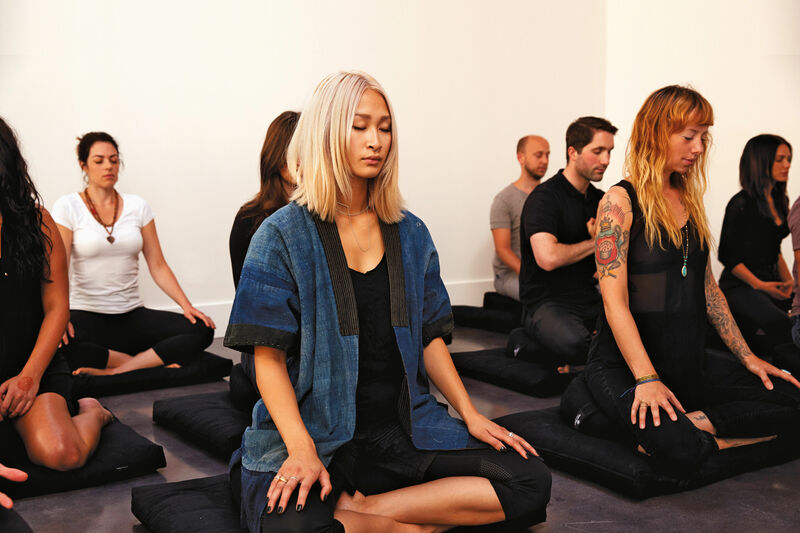 Community drop-in meditation sessions hosted by Ryan Kenny, Hush guide and founder of Pause meditation, will take place every Saturday from 9-9:45 am starting October 24. These sessions are free to the public, with a suggested donation of $10. Email hush@hushmeditation.com to reserve your spot.